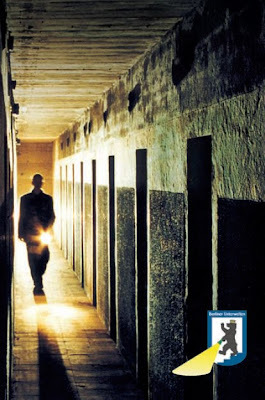 Berlin Underground do guided tours of the spooky underbelly of Berlin - through bunkers and ancient tunnels. While on the tour, Pink Floyd's "The Wall" album was playing over and over in my head - attaining slightly more meaning for every step I took. It was the most underground (literally) tour, telling us about escape tunnels and how people tried to escape East Berlin through the subways and sewer systems. We visited bunkers and bomb shelters, where the ceilings were low and the emotions were high. As you can see to the right - there is a glow-in-the-dark line that still held traces of radioactive material. So, you could basically write your name on the wall with a flashlight as it would glow for some time. The reason for the paint was so the people wouldn't panic while sitting in the dark and had a guideline of where the exit was. Unfortunately, we couldn't take pictures, due to copyright restrictions on a lot of the photos and artwork displayed, but I can't explain the feeling of such tough times for the people here. When Berlin was split in two, one Sunday in August 1961, 13,000 families were suddenly spilit up. Children visiting their grandparents in East Berlin could no longer go home to their parents. There were more than seven escape tunnels that were attempted within a distance of 350 meters of each other. There were only 2 successful tunnels to the west. Tomorrow I'll do semething completely different - visit Knut the polar bear at the Zoo!